As land continues selling out in Redbank at record pace, North Richmond Joint Venture is playing its part in a $73 billion-dollar transformation of greater Sydney. The NSW Government says Sydney is on the brink of its biggest-ever housing construction boom, which will see almost 200,000 homes built over the next five years. The release of the draft district plans by Lucy Turnbull's Greater Sydney Commission comes as Sydney faces planning and development challenges in the immediate future. Their ambition is for greater Sydney to be the kind of global city that is home to a mix and variety of places people want to live, work, study, play and visit – places that are close to those essentials like housing choices, jobs, education, healthcare, open spaces and facilities. According to NRJV’s Business Development Manager Jock Douglas, North Richmond is destined to become a property hotspot, following major spending in the surrounding areas. “There is more than $73 billion in infrastructure investment planned for Sydney over the next five years to cater for the ongoing growth”. “This includes WestConnex tunnel connecting M4 to Sydney Airport, NorthConnex linking M2 to M1, North West Railway line opening in 3 years, $35 million on a new Hurlstone Agricultural High School located at Western Sydney University Richmond campus, Parramatta to Sydney railway, Parramatta Urban Growth which involves the relocation of government offices from CBD and the $550m upgrade to Nepean Hospital to name a few”. Mr Douglas added that while Redbank continues to be an escape from the hustle and bustle of these changing areas and the benefits will be felt by all at North Richmond. Redbank’s first residents have arrived! 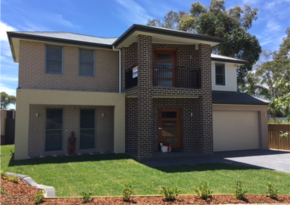 It has been a huge fortnight for one family as they made Redbank their home. Presented with a 1st resident ‘Welcome’ gift from the Developer by our Community Relations Manager, Brooke Taylor. The lucky residents said they were very pleased with how their build progressed and the final product. Our purchasers commenced their build shortly after registration, gaining approval through private certifier Urban City Consulting in Windsor. The now residents said they are looking forward to seeing the estate continue to grow and cannot wait for the parks, walkways and bike tracks to take shape as they are sure they and many other residents, will put them to good use. Construction of homes continues to take shape in the precinct. We now have 78 design and landscape plans approved, 60 homes under construction and 3 homes completed. Last week we had our largest ever standard residential resale of $675,000 which highlights continued growth in pricing across Redbank. Design and Landscape rebate applications are starting to come in. If your building and landscape works are completed within 18 months of the settlement of your block of land (home site), please ensure you have rectified any damage of the road, public, footpath, street trees, nature strip or services that occurred during construction, prior to applying. Any Yobarnie purchasers who will be moving in prior to Christmas please let out Community Relations Manager, Brooke Taylor know. 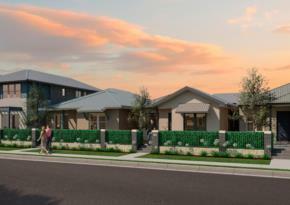 North Richmond Joint Venture hosted two open days for Mountain View purchasers last weekend. 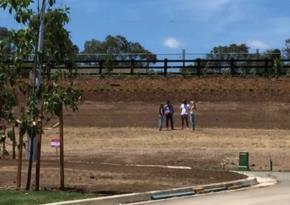 Mountain View purchasers were granted access to their lots prior to registration for a much anticipated viewing and for builders to undertake surveying and conduct soil testing. Developers generally cannot grant access to lots prior to registration due to ownership of land constraints during civil construction and landscaping. Due to changes in registration and the structured roll out of lots, some lot numbers in Mountain View have changed. An email was sent to purchasers last week advising which lots were affected. If you did not receive this email, please contact our Community Relations Manager, Brooke Taylor on either 0404 488 950 or by email at brooketaylor@nrjv.com.au. 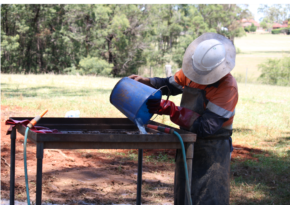 Works installing Sydney Water Infrastruture are continuing with the installation of a water main on Grose Vale Road, which commecned on Monday, 28 November 2016 and will continue through until just before Christmas. Mountain View purchasers will be advised of the staging of release for registration by the end of next week. Registration is anticipated to take place between December 2016 and March 2017. We have some exciting news for Belmont purchasers - early works including site set up for the Belmont precinct have commenced! The work undertaken over the coming weeks includes initial site works and dam decommissioning. Civil construction will not be commencing until 2017. All outstanding Development Applications within The Gallery have now been received by the Developer. Drinking water was connected to the Gallery precinct during the last fortnight. We anticipate the sewer connection to take place on Wednesday, 7 December 2016. Just a reminder that unlike our other stages, landscaping in The Gallery will take place after the construction of new homes is complete. This is due to the precinct being constructed as a whole by a single builder, MacDonald Jones Homes. We anticipate all necessary paperwork for registration for the first band of lots released, will be lodged with NSW Land and Property Information prior to Christmas and registration will take place in the new year. The developer is investigating the prospect of commencing earthworks on behalf of McDonald Jones Homes prior to registration to assist them hitting the ground running and keeping delivery of homes as close to the scheduled timeframe as possible. We will keep everyone informed if this becomes a possibility. A development application review date of 22 December 2016 has been set by the Greater Sydney Commissions – West Sydney Planning Panel. Civil Construction Design has commenced with leading civil engineering company J.Wyndham Prince and prominent landscape and design company Arterra. There has been another 12 sales in Yeomans latest release during the last fornight. 5 of these sales were over $630,000 per lot. Over the last 2 weeks aboriginal salvage has been taking place in the Yeomans precinct. This work has been undertaken as part of the Aboriginal Heritage Impact Permit approved for the site. We anticipate registration for Yeomans Stages 1-3 will take place in October 2017, with Stage 4 following in June 2018. This anticipated timeframe of course is, like all stages, dependent on final approvals and weather conditions during civil construction. .
A community consultation on the plan of management for the North Richmond release area was held on Wednesday, 23rd November 2016. The Hawkesbury Sports Council were briefed on the outcome of the Plan of Management Consultation on Monday, 28 November 2016. North Richmond Joint Venture have increased rescources and engaged Calibre Consulting to assist with Sydney Water infrastructure. Almost 200,000 new homes are to be built in Sydney over the next 5 years. The NSW Government has allocated over $73 billion on infrastructure over the next 5 years in Sydney to cope with this increase. 2.1 million new residents are anticipated to call Sydney home over the next 20 years. 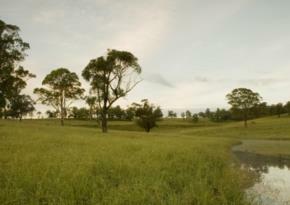 This weeks photo was taken on site across one of our dams. If you would like to see more of Toms photographs please contact our Community Relations Manager, Brooke Taylor for details.